Eliminate errors, reduce typing, and speed up check-in time with our easy to use ID scanner for the Check-Inn property management system! 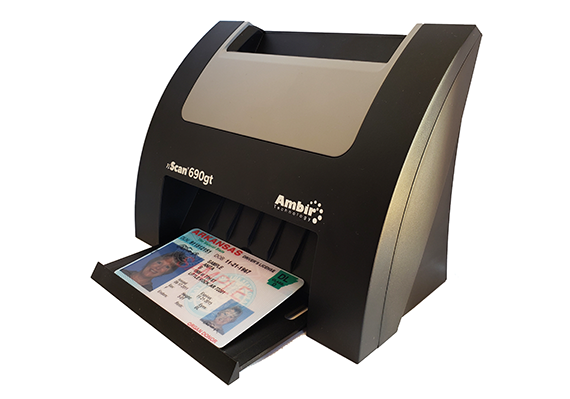 The Advanced ID Scanner is a versatile, compact device that will scan the guest ID, save a color copy of the image to the guest record in your hotel software, AND it will read the 2D barcode on the driver’s license. The scanner will pre-fill the encoded information into Check-Inn (available in most states, call for details). The color image of the ID will attach to the Guest Folio and will move to Guest History after check-out. You can save up to 4 ID images per room. An ID Guest List report is available that can be run and printed for all current checked-in guests. You also have the ability to print out guest IDs individually if needed. The Advanced ID Scanner takes around 2-5 seconds to scan an image of the ID and read/decode the 2D barcode. The ID scanner connects via a USB port to your computer for easy use. Advanced ID Scanners must be purchased directly from Innsoft and require an active service contract at the time of purchase.